This portrait is one of Dance’s most engaging portrayals of a male sitter, and is a fine example of his style. Thanks to Dance’s technique of using thickly applied and boldly coloured paint, it is also, like most of his works, in excellent condition. The sitter, George North, was the eldest son of Frederick, Lord North, the British Prime Minister best known for his calamitous handling of the American War of Independence. George North never attained the high office of his father, but was nonetheless a successful and popular political figure. After education at Eton and Trinity College, Oxford, he secured as his first constituency the Treasury-controlled borough of Harwich on 24th April 1778, which he maintained until 1784. Despite his father being a leading Tory, North himself was more sympathetic to the Whigs, and he played a key role in bringing about the Fox-North coalition in 1783. When King George III called for a general election in 1784, however, the electorate showed greater support for William Pitt the Younger (1759-1806), and North struggled to find a seat before the coalition collapsed, finally representing Wootton Bassett, which he held until 1790. North spent the rest of his career supporting Fox. According to Fox’s nephew, Lord Holland, North ‘…was of an indolent, careless disposition, easily satisfied with his company, averse to, if not incapable of, any extraordinary exertion of mind ... Yet he had many of the qualities requisite to form a leading public man—high honour, great frankness, a sound understanding, considerable talents for public speaking, and a temper more conciliatory than any man, Mr. Fox excepted, among the leaders of Opposition ... Even in wit and humour, though confessedly inferior to Lord North, he was by no means deficient.’ Ill health ended North’s political career in 1797, by which time he had succeeded his father as 3rd Earl of Guilford. North first married, in 1785, Maria Hobart, daughter of the 3rd Earl of Buckinghamshire, a match which met with family disapproval, owing to the lack of any dowry. However, North’s second marriage in 1796 more than addressed the balance, for his new wife, Susan Coutts of the Coutts banking family, came with a dowry of £150,000. Nathaniel Dance trained, like so many of his contemporaries, in Rome, where he studied and collaborated with Pompeo Batoni. 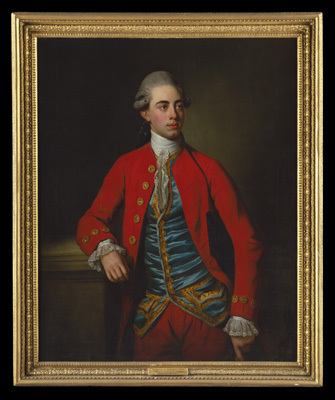 It was probably while under Batoni’s influence that Dance developed the use of the highly pitched colours that became his trademark, and which help convey this engagingly direct image of a gentleman at leisure. Dance initially worked in Italy as a history painter, but soon became known, as Walpole noted, as “the celebrated English painter at Rome” . His best portraits were of ‘Grand-Tourers’ such as Augustus, Duke of York (1764, Royal Collection) and David Garrick. The portrait of North here, however, would have been painted in London, probably in the late 1780s. It was in Rome too that Dance began his passion for the painter Angelica Kaufman, and where the two apparently determined to marry on their return to London in the 1760s – though sadly the union never occurred, much to Dance’s chagrin. Once back in London Dance established a successful portrait practice, where he continued to paint the colourful and expressive portraits for which he had become famous. At some point in the 1770s he became financially independent, and finally ceased painting professionally on his election to Parliament in 1790, when he also resigned his membership of the Royal Academy, of which he had been a founder member. He became a Baronet in 1800. In a curious reflection of the relatively low social status of artists in the early nineteenth century, Dance took care to disassociate himself with his artistic past, destroying many of his works, and exhibiting only the occasional landscape at the Royal Academy (in the catalogues of which he was listed in all cases, as ‘a gentleman’). Dance saw his great talent as a mere trade, and thus the work of Britain’s first neo-classical artist has become less well known that it otherwise should be.